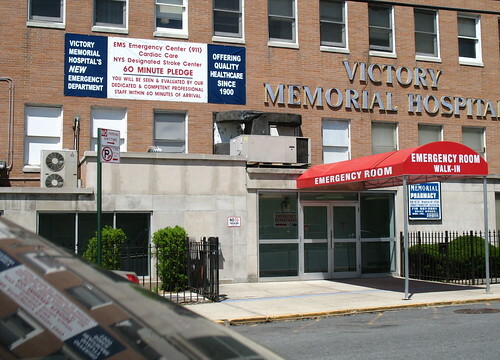 The 107-year-old Bay Ridge institution Victory Memorial Hospital is preparing to shut its doors. Hospital officials say they are now attempting to close the building by February 1, 2008. It is a big mistake to close this hospital down. This is the only hospital in this area that services this community. In a life and death situation, Lutheran Medical Center, Maimonides Medical Center, Methodist Hospital, Coney Island Hospital and Staten Island University Hospital will be too far away for people to get to in time to save their lives. Due to this misjudgement, the lives of the people in Bay Ridge, Brooklyn are being put at risk. The baby boomer population is getting older and will soon need more of these facilities, not less. Have we forgotten September 11, 2001? God forbid there is another 9/11 type attack on this city and there are thousands or millions of injured people. This city is going to need every possible hospital that it has. It should be the focus of the people in charge to keep hospitals open — not close them down. I say: It would be in the best interest of all the politicians that have anything to do with this to keep this hospital open. It is sad to see any hospital close, good thing they were able to save Long Island College Hospital. not only that, but that hospital can’t save lives. The doctors and nurses dont know what the hell theyre doing and the hospital staff dont give a damn. They let people die through negligence and malpractice. What a shame for a place of healing to bite the dust. But then again if there were so many unqualified staff, perhaps it was for the best. Where do the medical records of 2/8/2005 go?? I was born at Victory Memorial over 62 years ago. My younger sister was born there, too. We are saddened to see such a Brooklyn institution disappear. My mother used to rave about the care she received there and we will always be grateful to them for that. Best wishes to the staff and friends of Victory Memorial. I was born there more than 11 years ago . Its a shame to see this hospital close down … plus i can’t even see my medical records. I don’t know how i could have missed that 5 years ago . Closure of any healthcare center is sad. The population is increasing. If we cannot have more hospitals, old ones should not close because that will lead to serious overload for the remaining ones who will have to manage by ….you know it… maintaining more stringent measures. Those complaining haven’t seen anything yet. At the rate hospitals are being closed, people might start going abroad for healthcare all because the greedy corporations are used to taking inflated fees and do not want to take cuts. The only way to stop the tide of closure is to find ways to reduce the cost of maintaining the hospitals. What your saying is true, under the current system the Corporations run the country and the politicians especially the Republican party(under the disguise of patriotism) are all for that. The American people need to wake up and realize what is going on before Wal-Mart and McDonalds etc start calling all the shots !! Anon must be a former SBHS student. BTW Posting !!! Kevin, Not many people left on here. I check site every so often ,not much happening on here anymore. Are you the Kevin who lived on Garland Ct.? So Kevin did you sell the house you bought to flip yet? Are you still here or back in Florida ? Posing ??? Some things never change ! I need my medical records from Victory Memorial Hospital. I gave birth to two sons, one was alive, the other was demised. I need to retrieve that medical records. Please help me where to find my medical records with this hospital.